So far, Natalie is not "crawling" in the classic sense of the word, but she sure does get around! She's been rolling everywhere and backing herself up into a "sit" from all fours. She definitely rocks and tries, but so far hasn't gotten the hang of moving forward. She's been doing a lot of "down dog" baby yoga and trying to pull herself up on everything she can possibly get her hands on, so I know as soon as she strengthens those muscles enough she will be moving around like crazy. Also, this month, Natalie finally discovered her inner foodie. She hadn't been a huge fan up until a few weeks ago, and now she's feeding herself tiny pieces of whatever we happen to be eating, and it's been so much fun! So far her favorite things are chicken, turkey, cheese, broccoli, and macaroni. I still attempt to end her meal with a puree, but she hasn't been finishing them lately. I think she's just about ready to give them up all together. 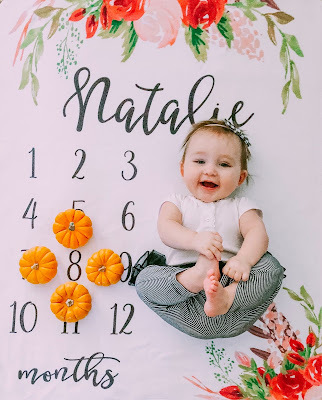 Natalie had her first trips to the county fair and the pumpkin patch this month, and I am so excited to do all the other "fall things" with her! Our Halloween costumes are ready to go, and I can't wait to see how much more fun it's going to be with both my girls! Happy 8 months, my peanut!